Templates and materials available on the Glowforge site make it easy to start with no experience required. Glowforge even provides a stack of free materials to get started with. I was able to make some custom coasters the first day I had my machine. Within the first week I had successfully cut and built a dinosaur for my daughter! I am a diehard Mac user, most lasers and their software only work with PCs which is a dealbreaker for me. The Glowforge operates using the Glowforge.com website or the Glowforge app, making more versatile than the other lasers on the market. The interface is intuitive very easy to learn. In addition to the great user interface, the Glowforge website also has community forums with everything from free design templates to tips and tricks, all submitted by other users. It is a great place to find answers to common (and uncommon) questions, post photos of your creations, and get inspiration for new projects. For my business, I needed something powerful enough to cut through 1/2 inch thick wood. At this price point ($5K and less) there are not a lot of options. I looked at the other “hobby” machines but they seem to focus more on engraving and don’t quite have the cutting power I needed. I looked into the machines manufactured in China and sold on eBay, but I was worried about reliability and customer support. In the end, the Glowforge was the best option for me. The 45 watt CO2 laser is able to cut through some hardwoods up to 1/2 inches thick, which is exactly what I was looking for. I have been consistently able to cut through 1/2” thick poplar and aspen hardwoods with beautiful results. 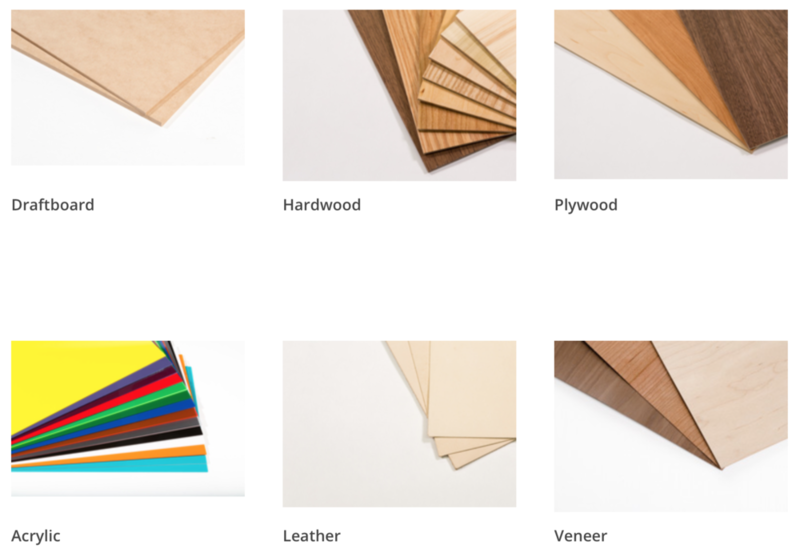 The Glowforge has the ability to cut and engrave many different materials, wood, acrylic, leather, cardboard, etc, and there are many places to purchase laser compatible materials on the internet, but Glowforge also manufactures materials specifically made for Glowforge machines. Glowforge’s Proofgrade materials arrive ready to be used with a removable paper sheet and a barcode for the Glowforge to read. I was reluctant for a long time to purchase these materials because of how much more expensive they are over other materials. The major benefit is that these materials are ready to use straight from the machine. No sanding, staining, or applying finish required. For me, the time savings is worth every penny. There are many more reasons why I couldn’t be happier with this machine, it has done wonders for my business and my ability to customize for my customers. Online searches will also uncover criticisms of this machine such as the reliance on wifi to work, after a year of use that has never been a problem for me. I honestly use my Glowforge every day and with regular cleaning and maintenance, it has been extremely reliable. If you are interested in purchasing your own Glowforge, please use this link for $500 off a Pro, $250 off a Plus, or $100 off a Basic. A couple of months ago I was contacted by the Keson company asking if I would be interested in reviewing their 48” focus vial level. OF COURSE I WOULD! I own several levels. Most of them are good quality levels that were handed down to me from my father in law who recently retired and sold his landscaping business. I use levels for a wide variety of tasks, both for my business and around the house. The Keson level is definitely an upgrade from the hand-me-down levels I’ve been accustomed to. This is a heavy duty level, for sure. Compared to the lightweight levels I use regularly around the house, this one feels like a tank. It is clear that this level was built to last and can stand to take a beating. Which is good if you’re using it on a job site. There are rubber bumpers on the ends of the level which protect the level in case of drops. The key feature of this level is definitely the focus vial. For people unfamiliar with it, the focus vial basically magnifies the level vial making it more visible and more pronounced. The secondary benefit having the magnification piece on either side is protecting the vial. I was able to read the level vial from a distance, and in low light situations, which is a plus. Magnets line the bottom side of this level, they’re not a unique feature, but are incredibly convenient when working with steel and other metal surfaces. The magnets are strong enough to hold the entire level up vertically when against a metal surface and should easily attach to any metal work cart. All in all it is a great level and I am happy with this addition to my workshop. With heavy duty construction I would recommend it for anyone looking for a solid job site level. Over the last few years I have made many of these entryway organizers. I was originally making them out of pallet wood but eventually grew tired of cutting the pallets into usable pieces and removing all of the nails. Now I use edge glued pine and the build process is much quicker. Using a big panel like this saves me a lot of time. I pick this up at my local lumber yard for under $10. I start by cutting a piece 10.5” tall by 15.5” wide. You can substitute using a big panel by gluing together narrower pieces side by side to reach the same dimensions. I always prefer this piece to have vertical wood grain. Next, I cut the rest of the pieces. I use a table saw to cut the 1.5” strips and 2.5” strips. I apply wood glue to each piece before nailing. I attach the triangle pieces to the mail slot with one nail on the underside and one nail on the top side. After all of the pieces are assembled and nailed into place. I allow some time for the glue to dry before applying the stain. I also go through and give all of the edges a light sanding. On this one I am using classic gray wood stain, but this design looks great in any variety of colors. I really love the look of this Minwax Classic Gray on pine wood. After applying the stain, I’ll let it dry overnight before finishing up with the hardware. I add two D-ring picture hangers to the top corners and two clear rubber feet to the bottom corners for wall hanging. I always make sure to pre-drill the holes before putting the screws in, it makes the process a whole lot easier. I use screw eye rings and braided steel wire for the sunglasses hanger. These are called dual prong utility hooks. You can also use cup hooks if you prefer the look of those. And here is the finished product. Over the years of making these I’ve gotten pretty efficient, this one probably took about 30-45 minutes to make. Here are a few examples of other styles of organizers I have made using different types of wood, hardware, and wood stain colors. This was the first entryway organizer I ever made. It was a semi-original idea heavily inspired by designs I found on Pinterest. This is made entirely of pallet wood, it was not sanded, and colored using Minwax Early American. The word mail was spray painted on using black spray paint and stencil letters. This is made from pallet wood, sanded and stained with Minwax Espresso. To achieve this look, after assembling the unit, I stained it with a dark color, let that dry overnight, and then gave it a coat of white spray paint. After the paint dried, I sanded the entire organizer with a palm sander. This is a great way to achieve a weathered look. This one was an ode to the early design, utilizing new pine wood instead of reclaimed wood. I used large cup hooks for the key holders and spray painted the word mail using stencils, I colored the wood using Minwax Early American. This one was made using new pine wood and the coloring was done with Minwax Espresso. The idea for this came from other Halloween signs I found on Pinterest. For mine, I used a 12” x 36” pine panel to attach all of the pieces to. I cut out all of the letters and shapes out of wood with my laser cutter. If you don’t have a laser, these shapes can be cut out of vinyl with a Cricut or Silhouette machine, another option is to hand paint the shapes. I used the mighthype font for the word happy, and hiragino kaku gothic font for halloween. The spider web and the bats I found doing a google image search.